In the City of London bustling with major international banks and financial institutions, Gough Square is a quiet corner in the southwest. At the entrance to the square stands a 4-storey house of the late 17th Century. Inconspicuous as it is, this house is a sacred place in the eyes of English language and literature followers around the world. From 1748 to 1759, Samuel Johnson, a British literary giant lived and worked here. It was in this house that he compiled his greatest work: A Dictionary of the English Language, also known as Johnson's Dictionary. As an author with many works to his credit, Samuel Johnson wrote a lot of literary reviews, essays, poems and biographies. However, his greatest accomplishment was no doubt Johnson's Dictionary first published in 1755. Following its publication, which was received with great enthusiasm and appreciation, the Johnson's Dictionary went on to hold undeniable authority and influence in the English speaking world for over a century and a half. It is therefore no overstatement that the Johnson's Dictionary has played a role in helping English to develop into a "world language". With the publication of the Dictionary Johnson's fame spread far and wide, and his erudition, wisdom and perseverance were recognised by the world. Although he had dropped out of Oxford due to poverty, the university awarded him with an honorary doctorate after the Dictionary was published. Hence, he is known as Dr. Johnson. The significance of the Dictionary is only one of many contributions to Dr. Johnson's fame and the public interest in him for over 200 years. There were also his wit, distinctive personality and the many thought-provoking epigrams. In 1911, Cecil Harmsworth, a Member of Parliament, bought the house, restored it and opened it to the public as Dr. Johnson's House. In spite of the vicissitudes over the years, the house has retained many of its period features. 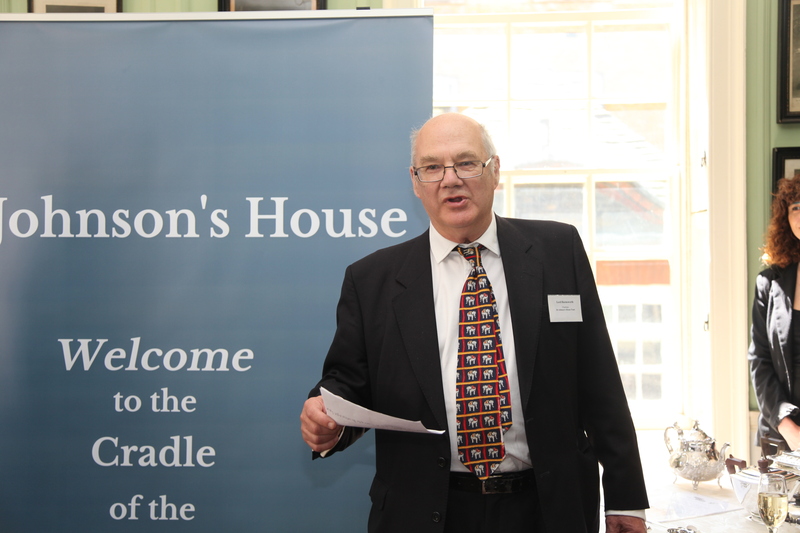 It has recently launched a new digital audio tour in Chinese thanks to the vigorous efforts of Lord Harmsworth, grandson of Cecil Harmsworth and Chairman of Dr. Johnson's House Trust. This would enable Chinese visitors to learn about the British literary giant and understand Britain's history and culture in a more direct, vivid and comprehensive way. 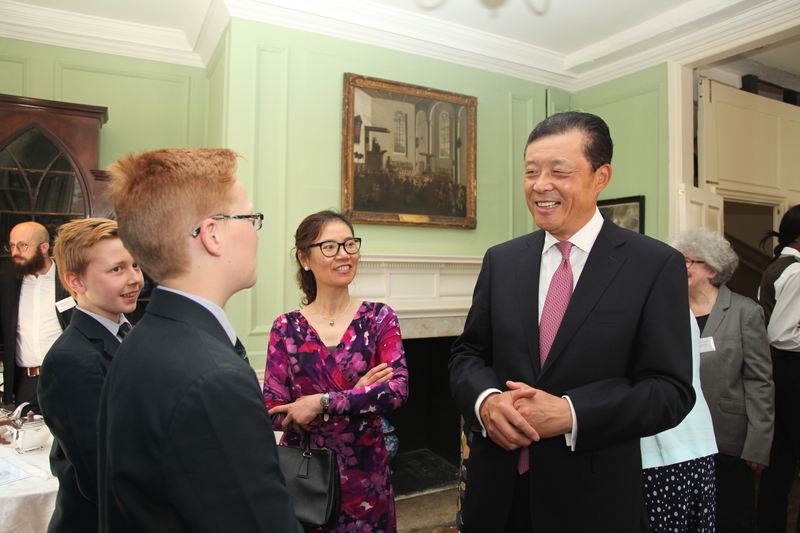 On the morning of 16 June, Ambassador Liu Xiaoming and Madam Hu Pinghua attended Dr. Johnson's House launch of the Chinese language audio tour. 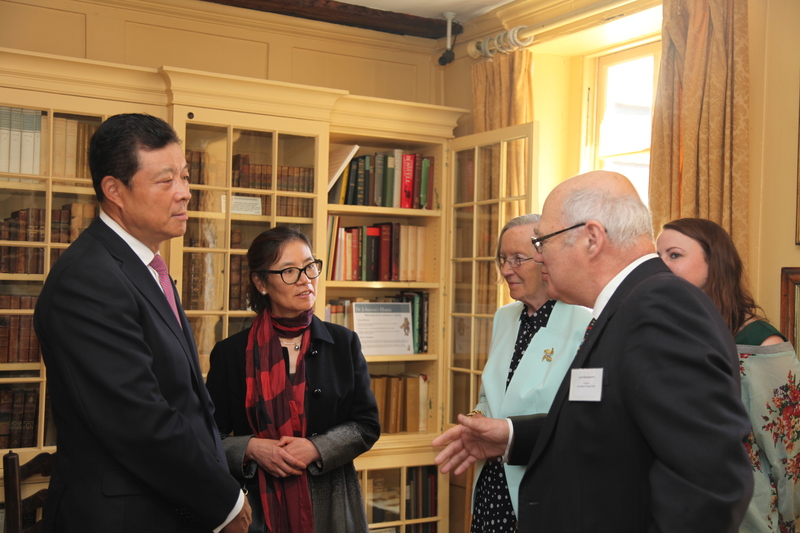 Upon arrival, Ambassador Liu and his wife were shown around the building by Lord Harmsworth. Small and exquisite, the rooms of Dr. Johnson's House are furnished in a minimal yet classic manner. The Chinese audio introduction, fluent and clear, could be heard from mini speakers. Articles associated with Johnson are displayed in the showcases in the reception room on the ground floor, together with portraits of Johnson and his Jamaican footman. Above the fireplace in the living room on the first floor was a painting of Johnson's hometown. The second floor used to be Johnson's bedroom but has now been converted into a library with not only a complete collection of Johnson's works but also books about him in various languages. The loft used to be Johnson's study where he completed much of his work on the dictionary. Contracted by a group of booksellers, Johnson and his assistant collected citations and wrote notes here. It took him 8 years to complete the compilation of the dictionary. 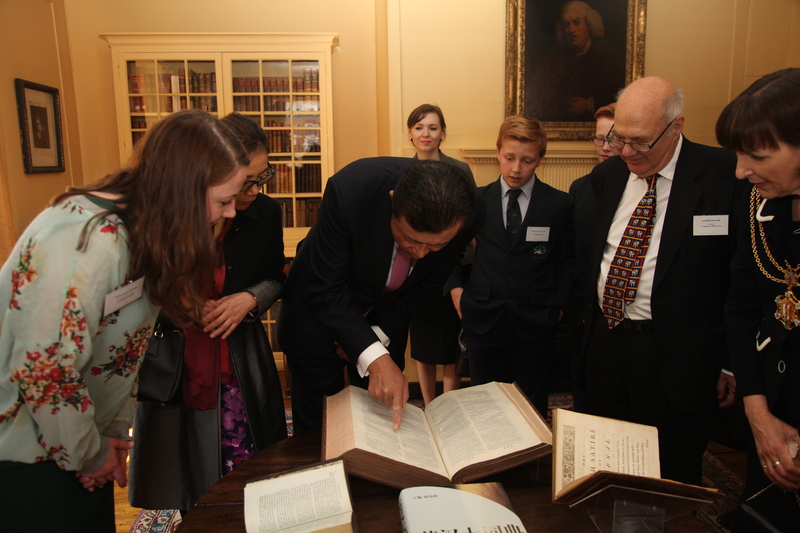 Ambassador Liu and Madam Hu stopped in front of two replica copies of the first edition of Johnson's Dictionary to take a closer look at a few entries. Ambassador Liu noted that Johnson offered 30 definitions for the word "cat" and 113 definitions for the verb "take", and marveled at the author's conscientiousness and painstaking efforts. According to Lord Harmsworth, Johnson's Dictionary with its 42,773 entries and more than 114,000 quotations of usages, has been regarded for 150 years after its publication as a finest example of English dictionary. It is also filled with Dr. Johnson's personal views and humour and had been a project of continued revision and improvement by the author himself. 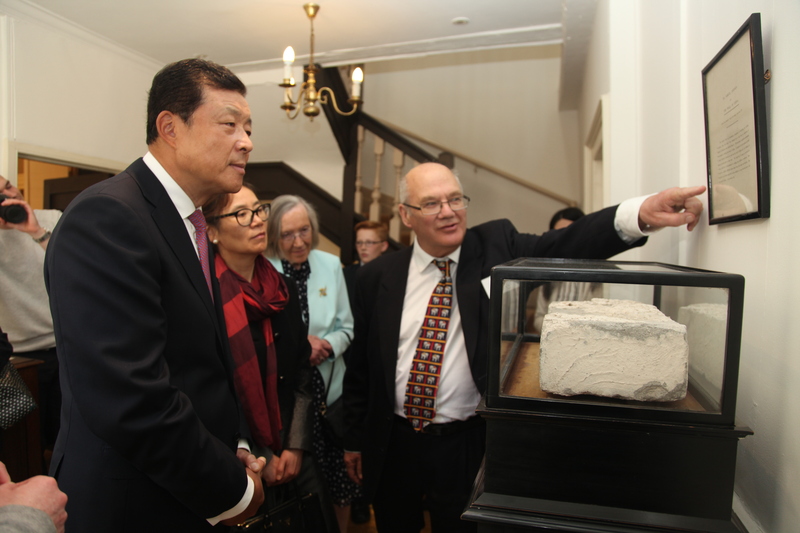 On the second floor, Ambassador Liu and Madam Hu noticed a large stone brick on display. Lord Harmsworth shared the story of the brick: Dr. Johnson had an exceptional interest in China. He wished to walk the Great Wall and had been urging his friend Boswell, author of the Life of Samuel Johnson to visit the Great Wall. He told Boswell that his descendants would pride themselves on it, because "they are the children of the man who has been to the Great Wall of China". To partly satisfy his unfulfilled wish, Johnson's friends gave him this stone brick, which was said to have been taken from the Great Wall of China. During the visit, Ambassador Liu spoke highly of the inspired initiative of Lord Harmsworth and his family in preserving Dr. Johnson's House, noting that it is precisely because of generations of unremitting efforts of the Harmsworth family that Dr. Johnson's House has been well protected and the study on Johnson has continued. After the tour of the house, Lord Harmsworth and Ambassador Liu delivered speeches at the launch of Chinese language audio tour. Lord Harmsworth said he was deeply honoured to receive Professor Cheng Hong, wife of Chinese Premier Li Keqiang at Dr. Johnson's House. He expressed appreciation for the personal interest of Professor Cheng and the vigorous support from the City of London and recognized the diligent work of volunteers over the past year in making the Chinese language audio tour possible. He believed that it would enable more Chinese people to appreciate the life and work of Dr. Johnson. He also hoped that historical and cultural ties would further contribute to the friendship between the peoples of the two countries. 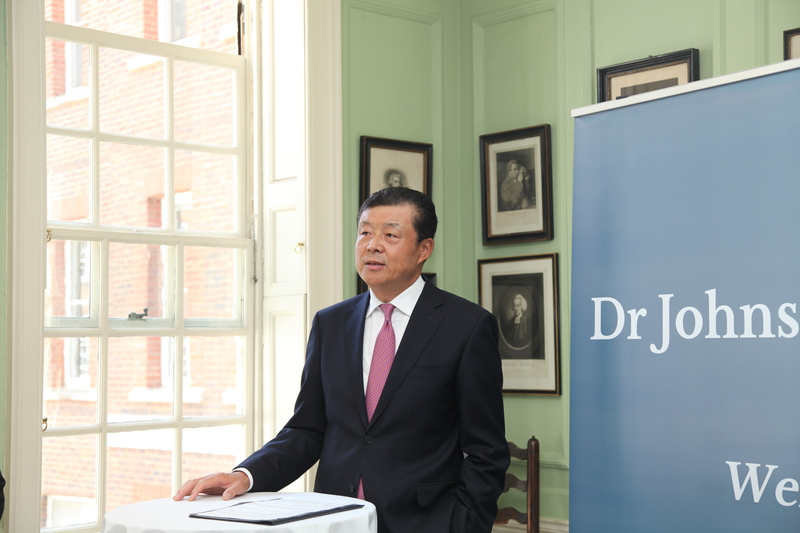 Ambassador Liu spoke of his impression after the tour and recalled Dr. Johnson's life with the audience, especially Johnson's special connection with China. He said Dr. Johnson had a strong interest in China – his love for Chinese tea, his wish to visit China and especially to walk the Great Wall. Although Dr. Johnson did not get his wish, 231 years after his death, China – its people and its language – came to him. The launch of the Chinese language audio tour was a clear evidence that Dr. Johnson's House Trust welcomed Chinese visitors. Ambassador Liu recalled the visit to Dr. Johnson's House by Professor Cheng Hong, who was in London accompanying her husband, Chinese Premier Li Keqiang, on a trip to the UK. She had followed closely the progress of the Chinese audio tour project, and on this occasion, sent her congratulations on the official launch of the Dr. Johnson's House Chinese audio tour. Ambassador Liu concluded with encouragements for sharing between the rich and splendid cultures of China and the UK. Both nations take pride in sharing knowledge about each other's civilisation. Sharing and appreciating each other's culture enhances mutual understanding and recognition, bring people closer and allow China-UK friendship to take deeper roots. The launch of the Chinese language audio tour of Dr. Johnson's House will further enable such sharing. Ambassador Liu hailed the launch as adding one more brick to the edifice of China-UK friendship and thus a highly acclaimed achievement in China-UK cultural exchange. Hearing the speeches of Lord Harmsworth and Ambassador Liu, the audience raised their glasses in a toast to Dr. Johnson's Chinese connection and the friendship between the peoples of the two countries. During the event, Lord Harmsworth introduced to Ambassador Liu and Madam Hu the two youngest guests - his grandsons: 12-year-old Frankie and 14-year-old Ethan Lee. The boys gladly told Ambassador Liu that they were learning Chinese. Influenced by their grandfather, they were both fond of the Chinese culture and history. Their biggest dream was to visit China, to walk the Great Wall and to fulfill Dr. Johnson's wish. When they grew up, they wanted to do something related to UK-China cultural exchanges. As they were practicing their newly learned Chinese language skills, their grandfather looked on, beaming with pride. That, and the efforts Lord Harmsworth has put into the new audio tour in Chinese at Dr. Johnson's House, seemed to have said it all about his passion for China. The event soon came to an end. When saying goodbye to the guests, Ambassador Liu and Madam Hu especially encouraged the two boys to learn Chinese well in order to carry forward China-UK friendship.